When scientists look back to the first quarter of the 21st century, they may marvel at what was accomplished in the treatment and prevention of Alzheimer’s Disease. Alzheimer’s is the most common form of dementia and is reaching global proportions. The World Health Organization says more than 35 million people now live with dementia and that number is projected to double by the year 2030. As people live longer, there is growing pressure to develop a drug or vaccine that stops dementia. Health and Human Services Secretary Kathleen Sebelius says setting priorities and coordinating research now will save time later. “We’ve made the first historic investment of funds and a 15 year commitment to prevention and treatment,” she said. In the past, the disease could be diagnosed only by doing an autopsy after the patient died. Alzheimer’s researcher Ronald Petersen says new methods now can provide evidence while the patient is still alive. “We use biomarkers, various imaging tests, blood tests, spinal fluid tests that are going to tell us that these are in fact indicators of what the disease is going to be,” he stated. In images provided by the Banner Alzheimer’s Institute in Phoenix, Arizona, you can see the progression of the disease. Inside the brain of an aging patient, the dark areas are formed by plaques – made up of the amyloid protein – and tangles – composed of another protein called tau. The result is a loss of brain cells and neurons responsible for memory and learning. During a national summit last month on Alzheimer’s research, two promising clinical trials generated a lot of interest. In this trial, patients already showing signs of Alzheimer’s are given nasal syringes of insulin that push the drug into the neurons of the brain. “Nearly three-quarters of participants showed improvement in memory over the four-month period, a 50 percent improvement,” said Dr. Suzanne Craft, who is in charge of the study.. But another study may promise earlier treatment to actually prevent the disease. Two years ago, New York Times reporter Pam Belluck and a photographer traveled to Colombia to visit an extended family afflicted by early onset Alzheimer’s. Approximately one-third carry a genetic mutation that brings on the disease while they in their ’30s and ’40s. Belluck says the healthier, older generation, often cares for younger victims. “They may be bedridden. They need to be fed. They may need to be diapered. They’re also agitated,” Belluck spoke with VOA via Skype. Early next year, a team of American scientists and Colombian doctors will begin a five-year clinical trial of more than 3,000 members of the family. Not all of the patients carry the genetic marker and some will get a placebo. The head of the American team, Dr. Eric Reiman, says the immunization drug being tested is designed to clear the amyloid quickly from the brain. “If we intervene sufficiently early before the disease has ravaged the brain, we think these treatments might have their best shot of having a profound effect,” he said. Pam Belluck says the Colombian family members are anxious for something – or someone – to help them. Facing a grim future, many say they are willing to step forward if it will help them and future generations. You go into the kitchen to get something, only to forget what it was once you get there. You misplace your reading glasses, can’t find your car in a parking lot or draw a blank when trying to remember a friend’s name. It’s normal to have occasional episodes of minor forgetfulness. But “some types of memory loss are more substantial than others as we age,” says Arthur Kramer, a professor of psychology and neuroscience at the University of Illinois at Urbana-Champaign. “One aspect of memory relates different pieces of information and puts them all together, and that’s the type that isn’t quite what it used to be.” But the brain is surprisingly adept at compensating for aging, and other types of memory can improve or remain intact over time. Even more encouraging is that a set of relatively simple and inexpensive lifestyle changes can go a long way toward maintaining a vigorous mind. In late adulthood, the hippocampus, which is the brain region responsible for forming some types of memories, shrinks 1 to 2 percent annually, leading to memory problems and an increased risk for dementia. But regular aerobic exercise encourages the growth of new brain cells there, even if the workouts aren’t strenuous. Aim for at least 30 minutes a day, five days a week, of moderate-intensity aerobic exercise, such as brisk walking or biking. Social butterflies are more likely to retain their brain vitality. A 2011 study in the Journal of the International Neuropsychological Society followed 1,138 older people who were initially free of dementia. Researchers assessed their cognitive function and social interaction every year, recording how often they went to restaurants and sporting events, played bingo, did volunteer work, took short trips, visited relatives or friends, participated in social groups and attended religious services. Over an average of five years, the rate of decline on a broad range of cognitive abilities, including several types of memory, was 70 percent lower in the most socially active people compared with the least socially active. Activities that challenge the mind can help keep it sharp by stimulating brain cells and the connections between them. Studies indicate that participation in a variety of activities — such as joining a book club, seeing a play, listening to presidential debates, attending lectures and playing board or card games — helps preserve acumen. Any engaging pastime counts, including needlepoint, gardening, playing the piano, studying a language, bird-watching or memorizing dance steps — and the more, the better. 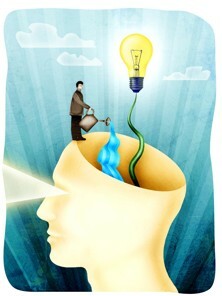 Regular consumption of fish, fruit and vegetables might protect mental agility. Researchers from the University of Pittsburgh tracked the diets and, using MRIs, the brain volume of 260 older people with normal cognitive function in a study presented at the Radiological Society of North America last November. After 10 years, those who ate baked or broiled fish at least once a week had larger and healthier cells in brain areas responsible for memory and learning than did those who ate fish less often. Chronic diseases that damage the arteries, thereby disrupting blood flow to the brain, might also injure the mind. That’s another reason to treat high cholesterol, hypertension and Type 2 diabetes and to lose weight, if needed. We need sleep to create memories, think clearly and react quickly; insufficient shut-eye hampers our ability to remember and reason. To combat sleeplessness, keep your bedroom cool and dark, avoid alcohol, caffeine and smoking, don’t exercise in the evening and turn off the television and all technology a few hours before you go to bed. Stress prompts the release of hormones that can weaken memory and even damage brain cells. Just 12 minutes of daily yoga for two months improved cognition among people with memory disorders in a 2010 study in the Journal of Alzheimer’s Disease. Other stress relievers include aerobic exercise, listening to mellow music, meditating or praying, and writing in a journal. Smoking increases the odds of memory loss in later life, but quitting at any age can halt the decline, evidence suggests. In an April 2011 study in the journal NeuroImage, researchers recruited older adults who were smokers and people who had never smoked, and invited the smokers to join a 12-week cessation program. Two years later, the rate of cognitive decline for successful quitters was similar to that of participants who never smoked, but those who were unable to quit declined more than those in either group. One drink a day for women and two for men is associated with reductions in cognitive decline and the risk of dementia. But heavy drinking can diminish memory by changing chemicals in the brain and causing deficiencies in Vitamin B1 (thiamin). And several studies report greater brain shrinkage among alcoholics. Reading proficiency is critical to academic learning and success in school. Studies show that children who learn to read in the early grades are more likely to become better students. In the United States, about 40 percent of children are left behind in reading. Scientists are researching how children learn to read and why some children have difficulty reading. 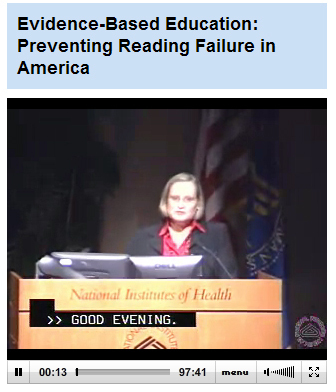 Learn about the progress to date of a comprehensive study that examines children’s reading abilities during the early years, including the efforts to understand how to prevent reading failure. Could a Diet Help Prevent Alzheimer’s? The low-fat, low-glycemic diet often promoted for general health and well-being may lower the risk of developing Alzheimer’s disease if adopted early in life, researchers say. But starting such an eating plan after symptoms surface doesn’t seem to help prevent deterioration of brain function, according to new research published online June 13 in Archives of Neurology.